Three-member delegation from the Swedish National Audit Office – Mr. Tomas Janhed and Mr. Andres Herjevik, audit directors, and Mr. Hazim Sabanovic, liaison officer, paid one-day working visit to the State Audit Office. According to the agenda, the topic of discussion is the process of financial audit, i.e. the financial audit phases. 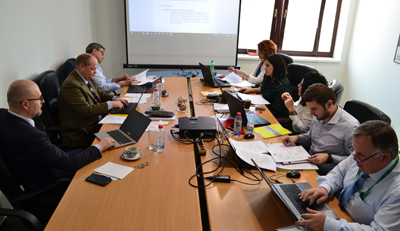 SAO representatives in the morning and afternoon working sessions were Maksim Acevski, Head of Department, Branislav Gulev, Head of Audit, Sonja Kambovska, Independent Auditor, Draginja Apostolova, Katerina Dzogkova and Saso Mateski, auditors.